Travel by train is my favourite way of getting around Germany. The trains are clean, nearly always on time and the rail network goes practically everywhere. All that efficiency though doesn’t come cheap. Unless you have a Eurail Pass, just turning up to the train station and buying a ticket is expensive. If you can plan in advance you can save plenty of Euros by booking online at bahn.com. This is the German Railways (DB) website in English, and it is easy to use. I booked a ticket from Essen to Amsterdam for 29 Euro. The price at the station on the day of travel was 55 Euro. That ticket had to be booked in advance, so it was helpful that I knew my itinerary. Once you have made your booking, you will get a printable PDF file which is your ticket. Booking online was a saving of nearly 50% compared to buying at the station on the day. Wow! Thanks for sharing such a great tip! I’ll keep that in mind if I ever have the chance to visit Germany! 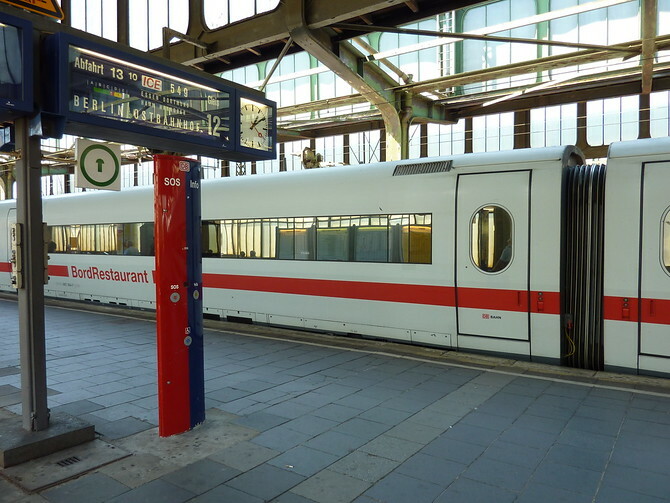 Interesting to read your “Meta” view about the german Bahn. A lot of heavy Bahn users in Germany consider the Bahn less in time than in former days. Actually they still try to push the Bahn company to the stock market and for this they have to save money (e.g. with less money for maintainance = less trains = delay if something is going wrong ). But yes – it’s still a great thing to drive by ICE with a notebook on the lap and a movie in the eye (but never on friday and sunday as the trains are overloaded then). 29 euros! that incredible. I’m going traveling around Europe next summer so I’ll be sure to use this website. How far in advance do you have to book in order to get a discount? I did by going onto Ltur website. There’s a Bahn button on the top of the screen. You have to buy the ticket two days before you want to leave and must scroll thru the list to find the red hilited tickets-Iwent from Munich to Berlin really cheap. You just have to be able to print out the ticket.